We don’t just create students; we create teachers. When she was three years old, our neighbor Nana would cry when we’d head to the park. Gun violence is so prevalent here, her earliest lessons involved dropping to the ground, then taking her pillow and blanket to the basement if she heard gunshots. Everyone in our community has been touched by the trauma of gun violence. Our space needed to be founded in mindful practices, because peace and healing start within. We started teaching yoga on the streets with our kids and adults. Then we started empowering them to teach. One breath is all it takes to create space between reaction and response. One breath can save a life. Nana is now nine and leads yoga classes for other kids and adults. Just like the rest of our community, all she needs is love, support, and opportunity—and she becomes unstoppable. 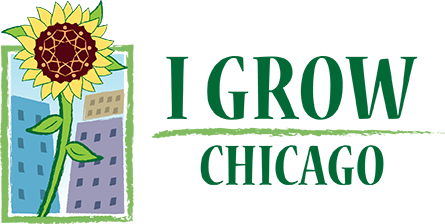 Empowering community residents to become community leaders. 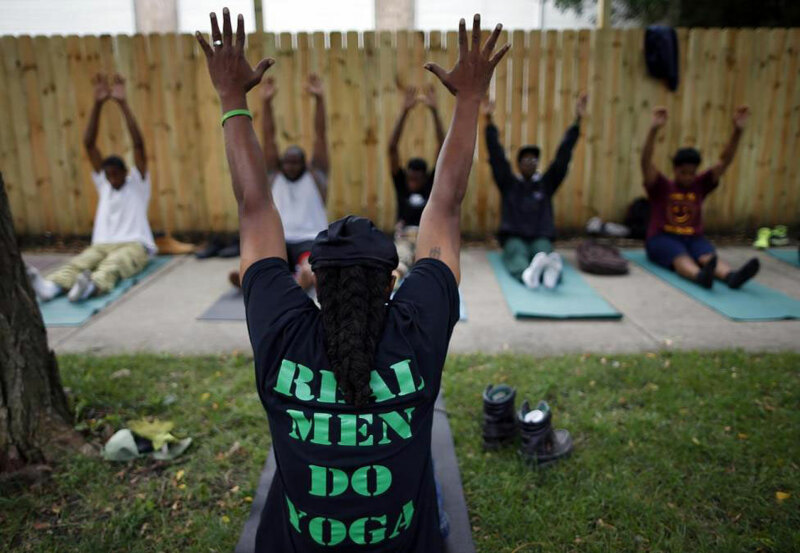 Englewood residents become healers and teachers though sponsored and facilitated teacher trainings in yoga, mindfulness, kai chi do, and other healing arts. Whenever possible, folks who have never traveled out of the city see themselves as part of a larger world and community by heading to trainings and experiences in New York, Florida, Virginia and even abroad. The power in this program is its reciprocity. As a teacher is trained, they give back service hours teaching yoga at the Peace House or at schools or at local businesses. We’ll then employ them as we also encourage them to get going on their own journey as a yoga teacher. Support for this program looks many ways. Scholarships from studios, volunteer teachers, and organizations like the Baptiste Yoga Foundation come in to lead workshops. Fostering healing and engagement among students. 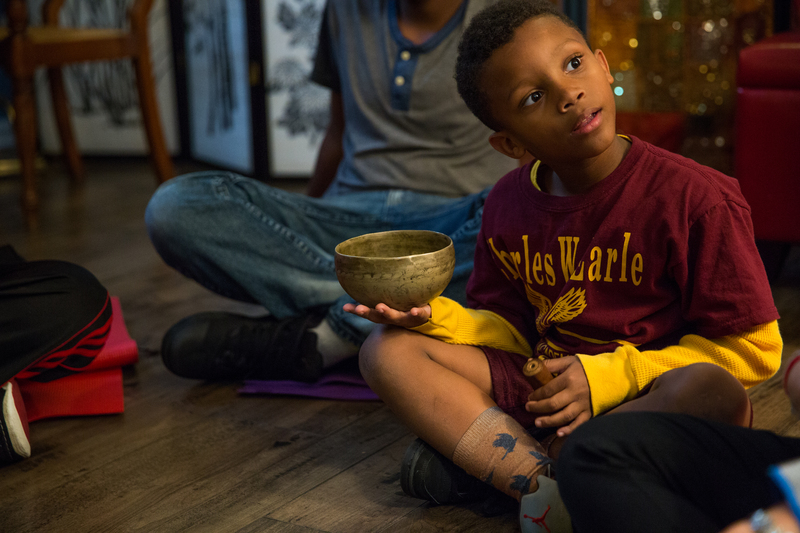 Young Yogis practice yoga and mindfulness, explore creative expression, and are offered opportunities for mentorship and to learn restorative justice practices. Through classes at community schools, daycares and the Peace House, we introduce the youngest Englewood residents to the power of their own breath. This program is led by the very community members who go through teacher training with I Grow. As part of their work service, they enter the community as role models and mentors, helping to change the cycle of community trauma to one of community healing. Recognizing one breath can make the difference between life and death. Residents learn to take a pause between reaction and response and participate in healing themselves and their community through yoga, kai chi do, and other forms of mindful movement. Free yoga classes are offered every Monday at noon at our Peace House and every Saturday at 11:30 at Kusanya Cafe. All ages and experience levels are welcome. All classes are free, with mats and props provided.